Shelly Golay’s Husband Jim was diagnosed with an inoperable brain tumor. Jim was the love of her life, and knowing his death would soon arrive was almost more than she could bear. After he passed away in July 2014, come Valentine’s Day 2015, she thought all she had left of her dear husband were memories. 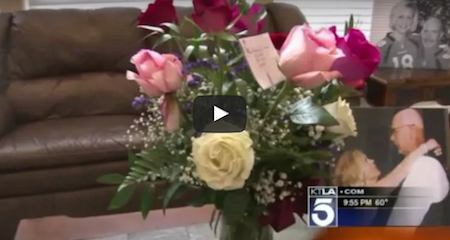 That’s when the doorbell rang – Shelly received flowers courtesy of Jim, her deceased husband. Shelly discovered that they were really from Jim when she called the flower shop. Even that exchange was emotional for one of the workers, who said she only saw this kind of thing in movies. “It was true love and you just don’t find that very often, you know. The fairytale romance, the knight in shining armor, you just don’t find that. And even though we didn’t get the fairytale ending, it was amazing,” she says. Please share this amazing virtue of love with your friends! She Set Up A Camera To Watch Her Dogs At Home, 10 Seconds Later…. WOW!